Map of the United States of America 1873. 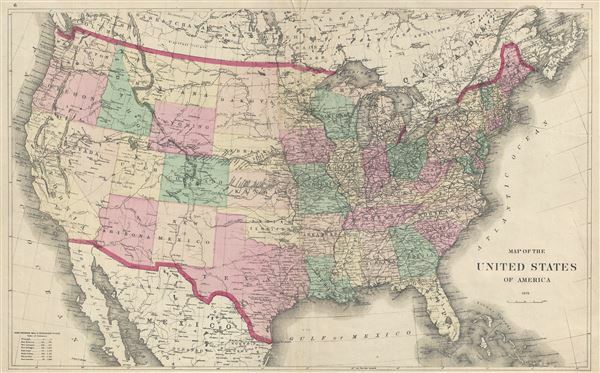 An attractive 1873 map of the United States issued by Fredrick Beers. This map covers the entire United States from Atlantic to Pacific, Canada to Mexico. It is color coded to identify all states. Important transnational rail routes are noted, as are major cities and military fortifications. The Unites States is today much as presented here with the exception of Dakota, which had not yet split into northern and southern departments. Published as plate nos. 6-7 in Beers' 1873 Atlas of Steuben County, New York. Beers, F. W., Atlas Of Steuben County, New York. From actual Surveys and Official Records. (New York) 1873. Good. Backed with archival tissue. Large closed and repaired tear from right margin - not exceptionally noticeable. Price accordingly.